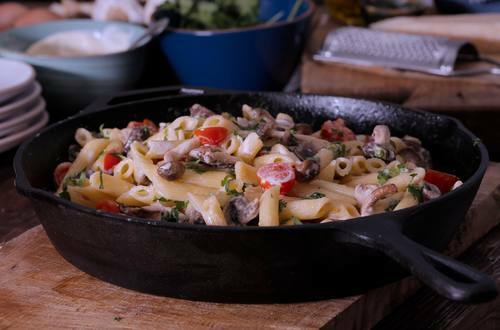 Penne Al Funghi Porcini is famously Pierce Brosnanâ€™s favourite dish. Weâ€™ve created a little variation on that classic. 1 Cook the pasta according to the pack instructions and drain using a colander. 2 Finely dice the onion, roughly chop the mushrooms and cut each cherry tomato in half. 3 Sweat the chopped onion in a non-stick frying pan with the oil until they soften and begin to turn brown. Add the mushrooms and fry until they also soften and brown. 4 In a jug, whisk the milk with the mayonnaise until there are no lumps, then add to the pan. 5 Add the cherry tomatoes to the sauce and heat through. 6 Stir in the cooked and drained pasta. Garnish with parsley and some grated parmesan cheese, then serve.